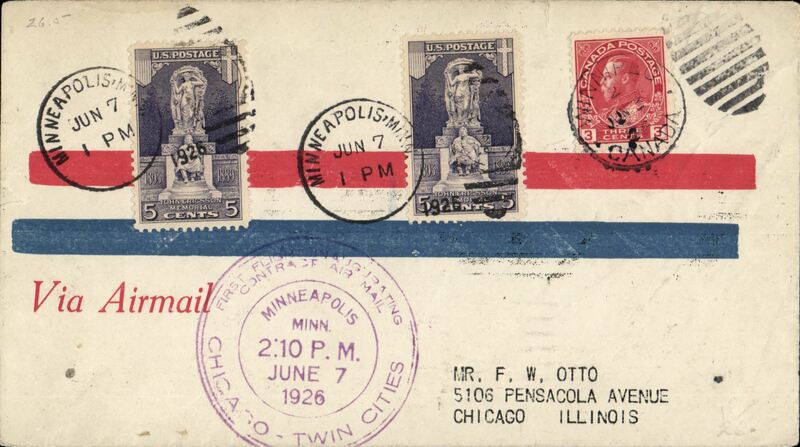 Crash Mendotta, Minnesota, CAM 9 return flight Mineapolis to Chicago, airmail cover franked US 10c and Canada 3c, large violet circular 'Minneapolis/June 7 1926/Chicago' flight cachet. Kohl, Loose & von Hunefeld, attempted trans-Atlantic flight from Dessau in Junkers plane 'Bremen' und 'Europa'. After 2500 miles the flight was aborted and they returned to Germany. 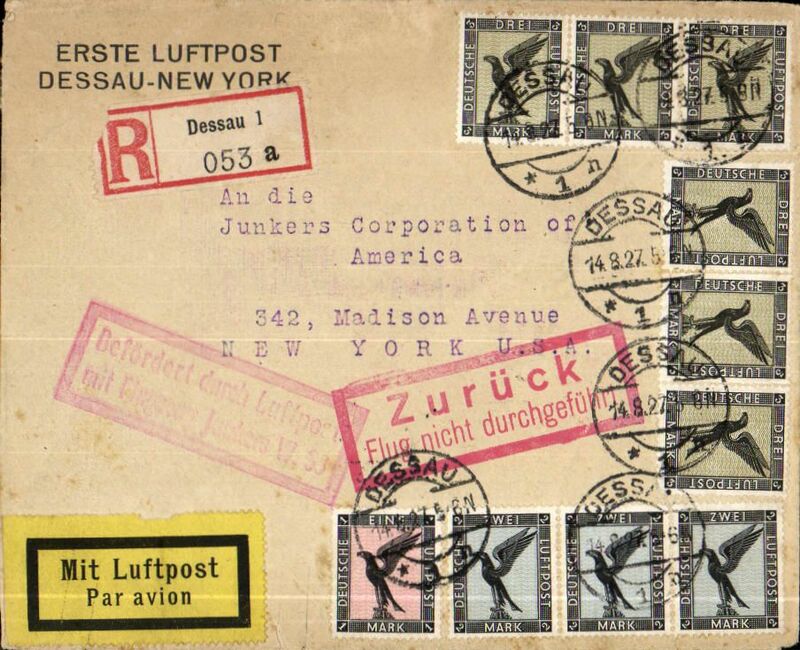 Printed registered (label) souvenir corner cover 'Erste Luftpost/Dessau-New York', red boxed 'Zuruck/Flug nicht durchgefuhrt' and 'Befrdert durch Luftpost/mit .....Junkers W.33' cachets, correctly rated 25Rm, canc Dessau 14/8, b/s Norderney 4/10. 1926 airs 1Rm x1, 2Rm x2 and 3Rm x6 make up the 25Rm franking, total SG cat £550 used. 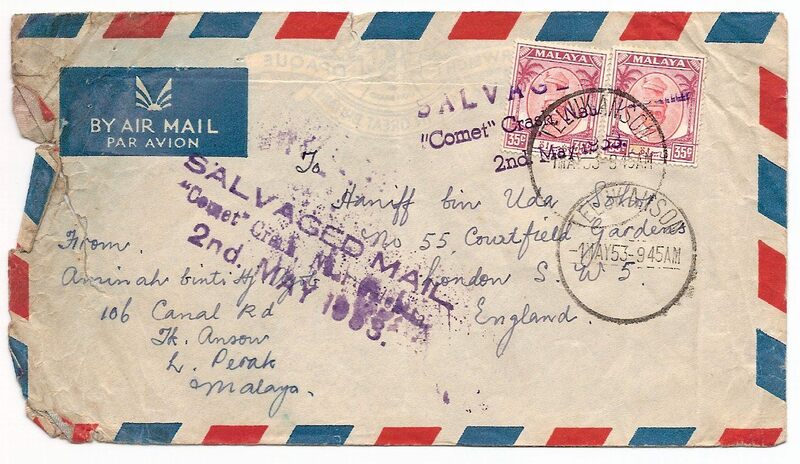 A scarce trans-Atlantic pioneer cover with impressive franking, and in fine condition. 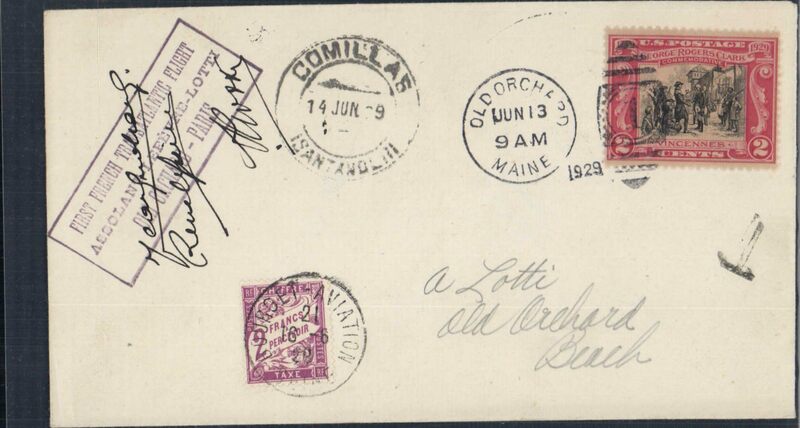 Old Orchard to Paris flight, crashed at Mimizan, cover franked 2c with Old Orchard cancellation of June 13, boxed violet three line "First French Transatlantic Flight/Assolant-Lefevre-Lotti/Old Orchard-Paris" cachet, and signed by all three pilots, Comillas 14/6 arrival cds and French 2c postage due stamp, tied by Bourget June 16 arrivl cds, both on the front, Ni 290614. Scarce pioneer trans Atlantic item in superb condition. Mermoz failed attempt at take off, Natal to Dakar, special pre-printed Aeropostale cover with a square cachet “Primeira Mala Aerea Transatlantica Directa Brasil-Europa” incorporated in the printing of the envelope, postmarked Rio de Janeiro June 7, 1930 and addressed to London (England) with no arrival b/s as is always the case with London arrivals. The crew of Mermoz, Dabry and Gimiי planned to cross the South Atlantic from Natal to Dakar with the mail but after 35 attempts at take-off in their Late 28 seaplane, they gave up and the mail was transferred to the usual Aeropostale aviso which made the service across the South Atlantic. There is also a large Rio postmark special for this flight. See Collot and Cornu. Ligne Mermoz. p. 152 –8 juin *. 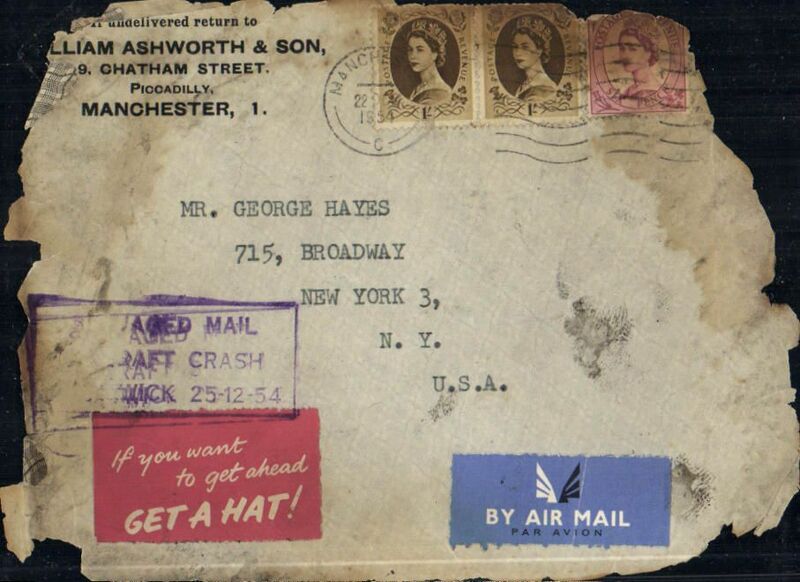 Most collectors classify covers from this flight as “Interrupted and Crash mail”. Faint ironed vertical crease. Chile to USA, posted Antofagasta 13/12, flown to Miami by Panagra, then to Salt Lake City by Pan Am, then by Western Air Express to Los Angeles. WAE plane crashed at Alhambra, 10 miles NE Los Angeles. Plane caught fire, but some mail saved. 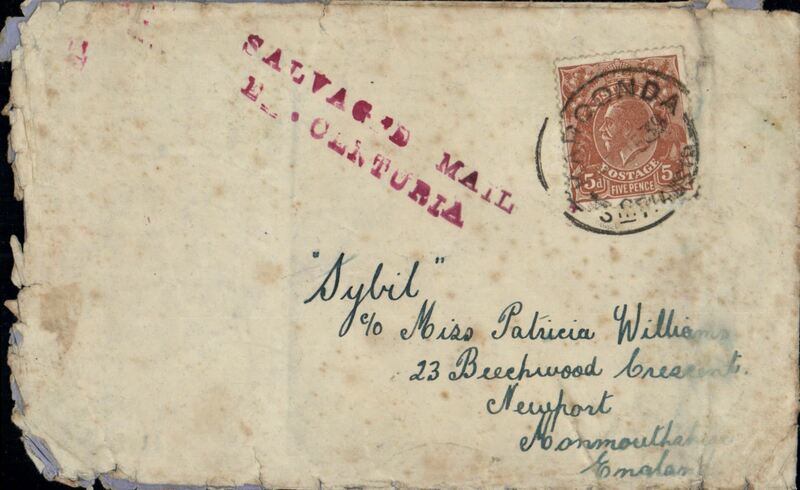 Cover has fire damaged corners, fine strike red two line "Damaged by Air Plane Wreck/December 22, 1930" cachet, residue of red 'Panagra' hs, and remaining damaged Chile stamps with fine strike Antofagasta cds. Listed AAMC. Saigon to Athens, bs 23/8, interrupted flight/accident of Air Orient Farman 303 due to a sandstorm near Damascus on the Baghdad-Damascus leg of the AO Saigon-Marseille service. 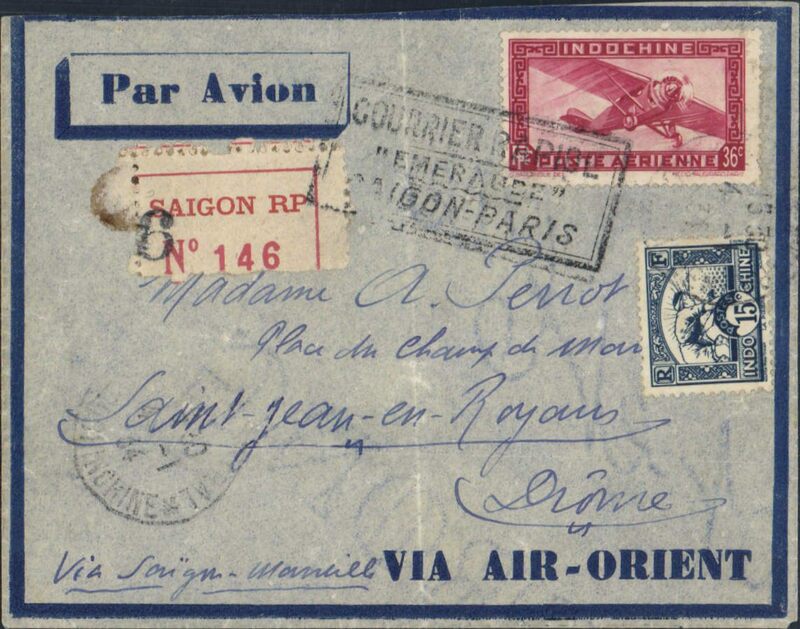 Airmail cover addressed to Drossos franked 50c, 10c & 5c, canc Saigon Central/Cochinchine/13.8.31' cds, typed "Via Air Orient/Saigon-Athens", fine strike Greek red circular 'Controle/Affert/Avion' currency control mark, violet 'biplane' airmail cachet used at Athens between 18/2 and 21/11 1931. 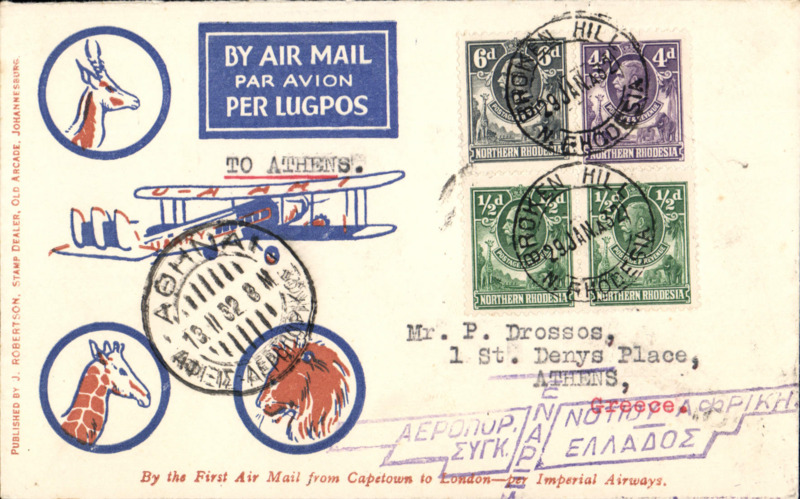 Following a dela, the flight was resumed to Marseille via Cyprus, Athens, Corfu and Naples. Unlisted in Nierinck, but listed as an accident in Ligne Nogues (Collot & Cornu), having departed Saigon on 22/8, and arriving Marseille 24/8. A scarce item in fine condition. 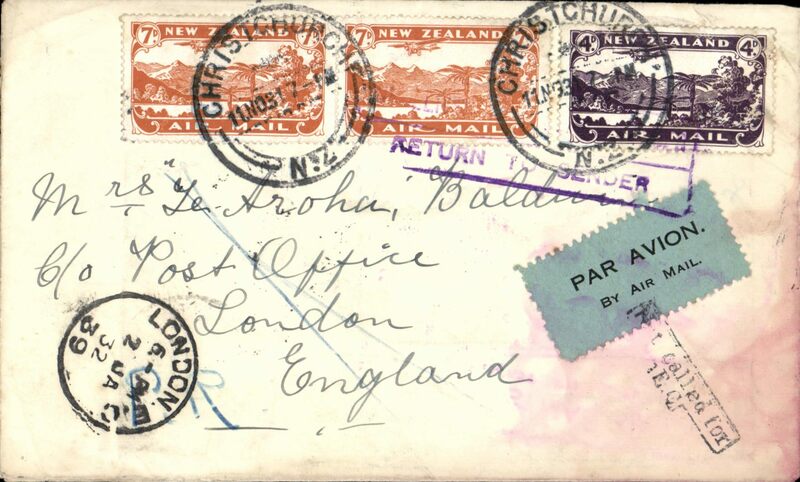 Christmas Airmail by ANA Sydney-London flight, Christchurch to London, bs 16/12, plain cover franked 1/6d, canc Christchurch 11/11/1931 cds, large red boxed 'New Zealand-Australia-London' light cachet verso stained by sea water, black/ green blue etiquette rated scarce by Mair. Delayed by crash at Alor Star, arrived London 16/12. 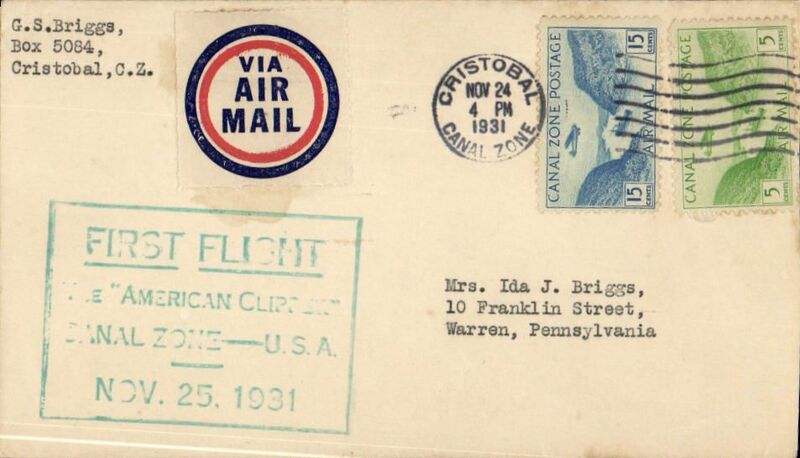 Lindbergh crash F/F American Clipper, Canal Zone-USA, flown by Lindbergh, carried on the inaugural mail flight of the American Clipper from Cristobal to Miami, airmail cover franked 20c large green boxed cachet "First Flight/The American Clipper/Canal Zone-USA/Nov 25, 1931", Pan Am. The flight was interrupted during take-off (AAMC 31.12A). Nice item, ex Krupnik. 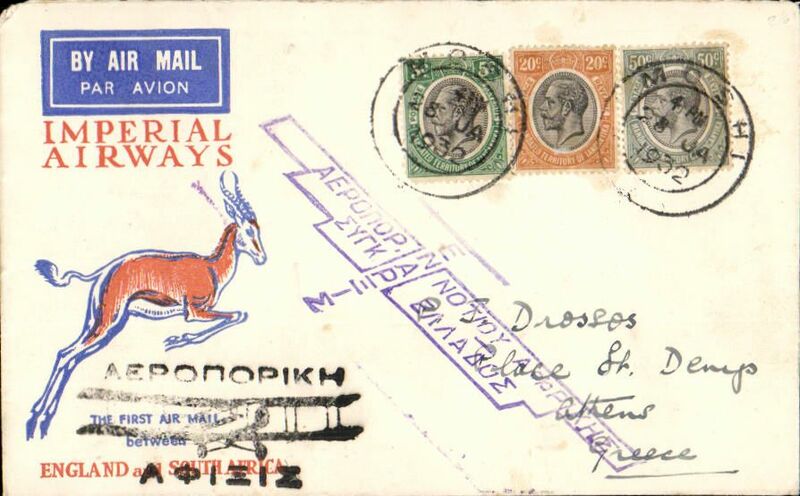 Windhoek to Nairobi, 7/2, interrupted first flight, SWA Airways Windhoek-Kimberley, connecting with the first Imperial Airways Cape Town to Croydon service, Springbok cover franked 4d, canc 'Windhoek-Kimberley/ First Air Mail/26.1.32' also small metal die 'Air Mail' ds applied at Windhoek. The 'City of Basra' was damaged at take off at Salisbury and mail was transferred to the 'City of Delhi', which then had to make an emergency landing due to bad weather near Broken Hill. Mail was then transferred to City of Baghdad, and arrived in Nairobi four days later than scheduled, ref Ni 320129 and 320129B. Windhoek to England, no arrival ds, interrupted first flight, SWA Airways Windhoek-Kimberley, connecting with the first Imperial Airways Cape Town to Croydon service, scarcer Robertson cover franked 3d air bil pair and 10d air, canc 'Windhoek-Kimberley/ First Air Mail/26.1.32' also small metal die 'Air Mail' ds applied at Windhoek. The 'City of Basra' was damaged at take off at Salisbury and mail was transferred to the 'City of Delhi', which then had to make an emergency landing due to bad weather near Broken Hill. Mail was then transferred to City of Baghdad, and arrived in Nairobi four days later than scheduled, ref Ni 320129 and 320129B. 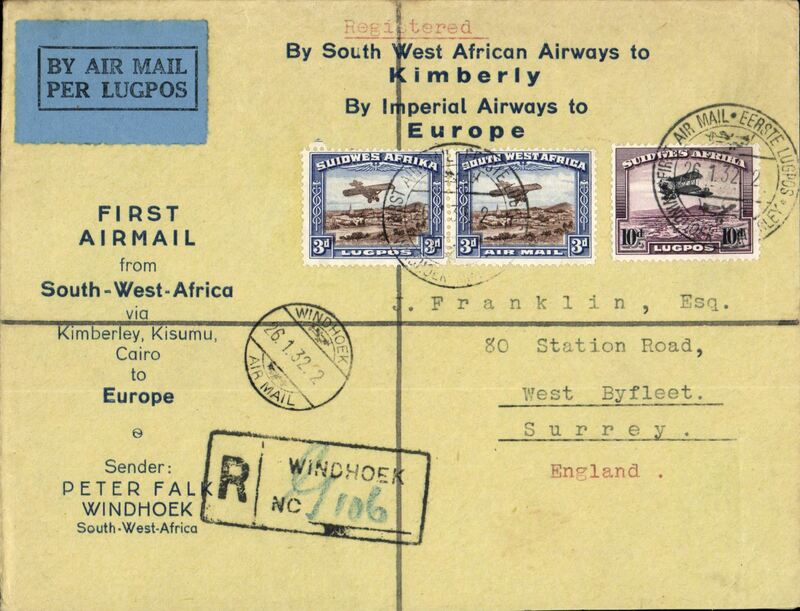 SWA to Europe, Windhoek to England, no arrival ds, interrupted first flight, SWA Airways Windhoek-Kimberley, connecting with the first Imperial Airways Cape Town to Croydon service, uncommon reg (hs) Peter Falk corner cover franked 3d air bil pair and 10d air, canc 'Windhoek-Kimberley/ First Air Mail/26.1.32' also small metal die 'Air Mail' ds applied at Windhoek and blue/orange Peter Falk vignette verso.. The 'City of Basra' was damaged at take off at Salisbury and mail was transferred to the 'City of Delhi', which then had to make an emergency landing due to bad weather near Broken Hill. Mail was then transferred to City of Baghdad, and arrived in Nairobi four days later than scheduled, ref Ni 320129 and 320129B. An attractive and unusual item. F/F SWA Airways Windhoek-Kimberley feeder service to connect with the first Imperial Airways Cape Town to Croydon service, airmail etiquette cover franked 3d and 10d airs, canc 'Windhoek-Kimberley/ First Air Mail/26.1.32' also small metal die 'Air Mail' ds applied at Windhoek and largw attractive blue/silver/black Deutsche Lufthansa . Moshi to Johannesburg, bs 9/2, via Mbeya 29/1, flown on the First regular flight Croydon-Cape Town 20/1/32, Delayed at Mbeya 29/1 and flown to Johannesburg by the next aircraft, Springbok cover, Imperial Airways. Interrupted flight. 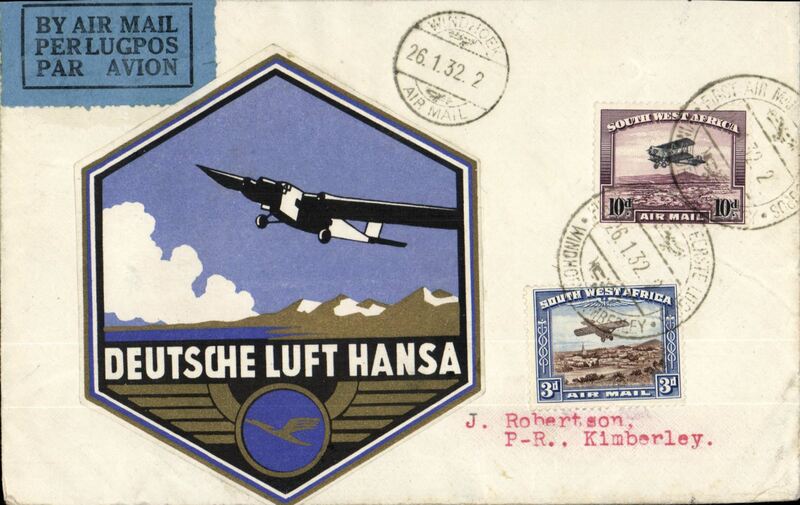 Interrupted flight Kimberley to Nairobi, bs 7/2, carried on first regular flight Cape Town-London, left Cape Town January 27 but forced down at Broken Hill, Northern Rhodesia, delayed 7 days, scarcer Rbertson blue/orange/cream souvenir cover franked 6d, Imperial Airways. Imperial Airways southbound England-South Africa service, F/F Moshi to Cape Town, bs 8/2, souvenir Springbok cover franked 55c. This flight was interrupted three times, first when the plane became bogged down in heavy rain on the airfield at Mbeya, second when it had to make a forced landing at Lake Shiwa, having had to overshoot Mpika again in bad weather, and third at Broken Hill when the plane was taken out of service to search for the first northbound flight from Cape Town which had crashed at Salisbury. Following the first interruption mail from Moshi was left behind at Mbeya, 29/1 transit cds, and collected by the second London-Cape Town service - hence the 8/2 arrival postmark, ref Ni 320129A. Interesting, a 150 word account of these events is included with this item. Imperial Airways southbound England-South Africa service, F/F Moshi to Johannesburg, bs 8/2, souvenir Springbok cover franked 55c. This flight was interrupted three times, first when the plane became bogged down in heavy rain on the airfield at Mbeya, second when it had to make a forced landing at Lake Shiwa, having had to overshoot Mpika again in bad weather, and third at Broken Hill when the plane was taken out of service to search for the first northbound flight from Cape Town which had crashed at Salisbury. 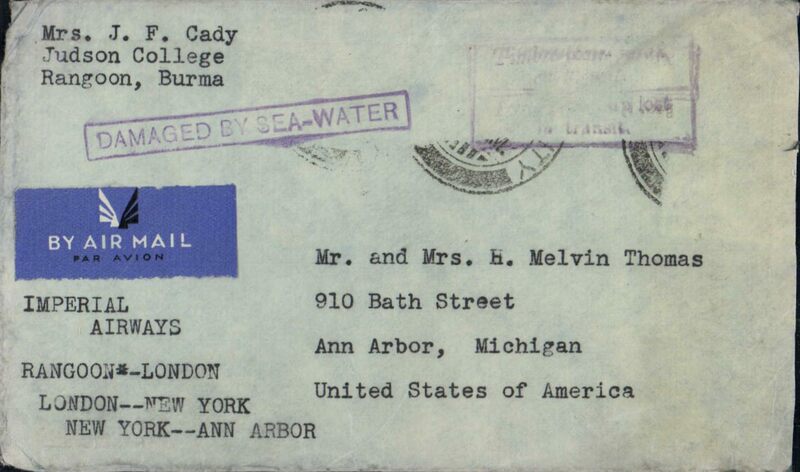 Following the first interruption mail from Moshi was left behind at Mbeya, 29/1 transit cds, and collected by the second London-Cape Town service - hence the 8/2 arrival postmark, ref Ni 320129A. Interesting, a 150 word account of these events is included with this item. Interrupted F/F cover, Cape Town to Dar es Salaam, registered (hs) cover franked 1/- & 4d airs canc Cape Town cds. Carried by Imperial Airways F/F Cape Town-London service from Kimberley to Dodoma, bs 11/2, then surface to Dar es Salaam, bs 13/2. This flight was twice interrupted. First the City of Basra was damaged at take of at Salisbury and mail transferred to the City of Delhi which, in turn, had to make an emergency landing due to bad weather near Broken Hill, when mail was transferred once more, this time to the City of Baghdad on Feb 6th, ref Ni 320129 and 320129B. Nice exhibit item, typed up on album leaf. 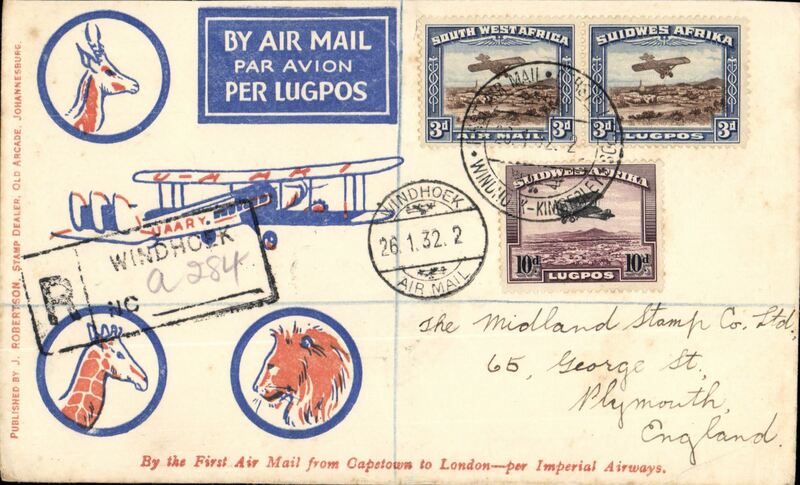 Imperial Airways, first acceptance of mail from Mbeya to London, bs 17/2, intended for the inaugural CapeTown-London service but, due to crash at Broken Hill, carried on emergency flight to Nairobi, and then onward by second Cape to London flight, Springbok cover franked 65c. Written up on album leaf with map of route. 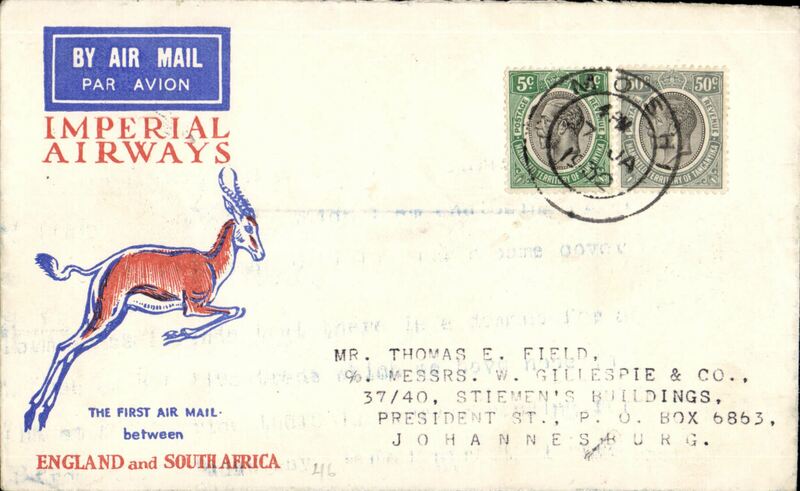 Imperial Airways twice interrupted flight first flight, Bulawayo to London, bs 17/2, red/orange/white Springbok souvenir cover franked, franked 10d, black st line "First Official Air Mail" cachet, carried on first regular flight Cape Town-London. The City of Basra was damaged at take of at Salisbury. Mail was transferred to City of Delhi, which had to make an emergency landing due to bad weather near Broken Hill. Mail was then transferred to City of Baghdad, and arrived in London 9 days later than scheduled, ref Ni 320129 and 320129B. 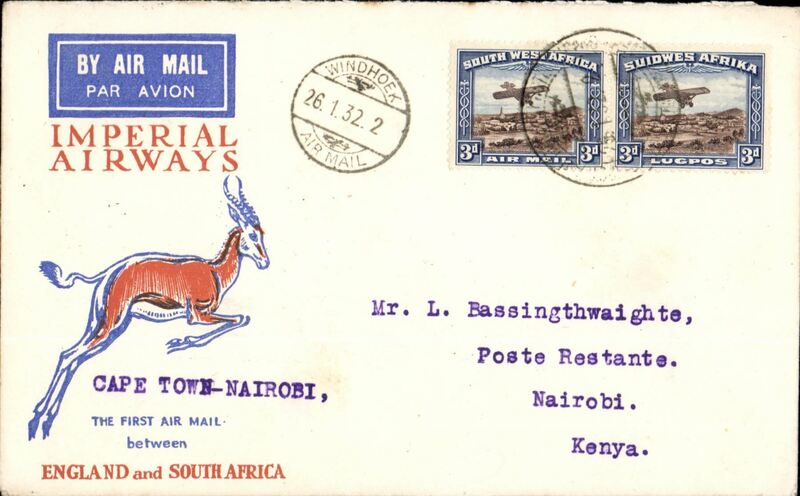 Scarce accelerated emergency mail, Imperial Airways inaugural Cape Town-London service, carried by 'City of Baghdad' from Moshi to Athens, bs 13/2, via Nairobi 3/2 transit cds verso, red/orange/white Springbok souvenir cover franked 75c, canc Moshi 28 Jan 1932 cds. The flight from Cape Town was interrupted twice, first when a wheel was damaged on take off from Salisbury, and again when bad weather forced the plane to land in a swamp near Broken Hill, ref Ni 320129 and 320129B. The 'City of Baghdad' waited at Broken Hill until February 2nd, when it took off via Mpika, Dodoma, and Moshi, arriving Nairobi 3/2. This accelerated emergency mail, backstamped between February 2nd and 4th is of considerable rarity, and of unusual interest to aerophilatelists in that it anticipated the first mails from points south of Broken Hill by several days. 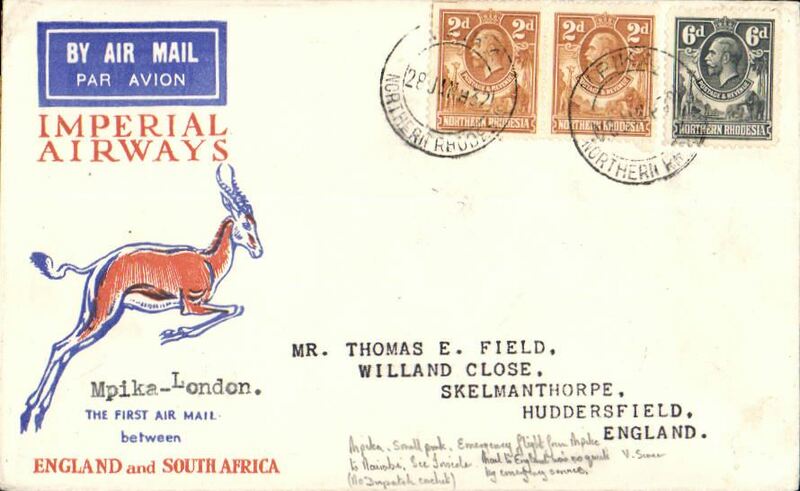 Imperial Airways twice interrupted flight first flight, Mpika to London, bs Skelmanthorp 17/2, red/orange/white Springbok souvenir cover, franked 10d, black st line "First Official Air Mail" cachet, carried on first regular flight Cape Town-London. The City of Basra was damaged at take of at Salisbury. Mail was transferred to City of Delhi, which had to make an emergency landing due to bad weather near Broken Hill. Mail was then transferred to City of Baghdad, and arrived in London 9 days later than scheduled, ref Ni 320129 and 320129B. There is a neat handwritten inscription which says this cover went on the Emergency flight to Nairobi, but there is no 3/2 arrival ds to this effect. 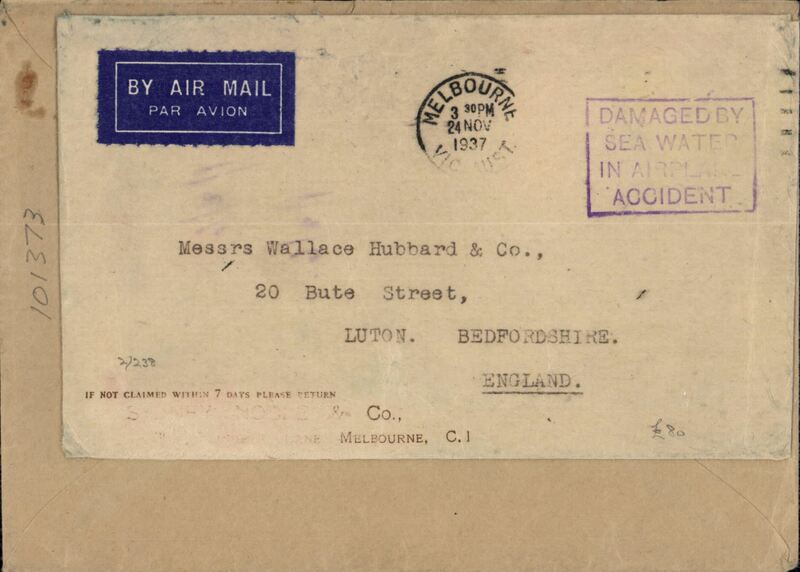 Argentina to Great Britain, Aeropostale Latecoere crash, following a lightening strike at Sebita (Brazil), printed company airmail cover from Buenos Aires, 25 Feb 1932 cds verso, en route to London. 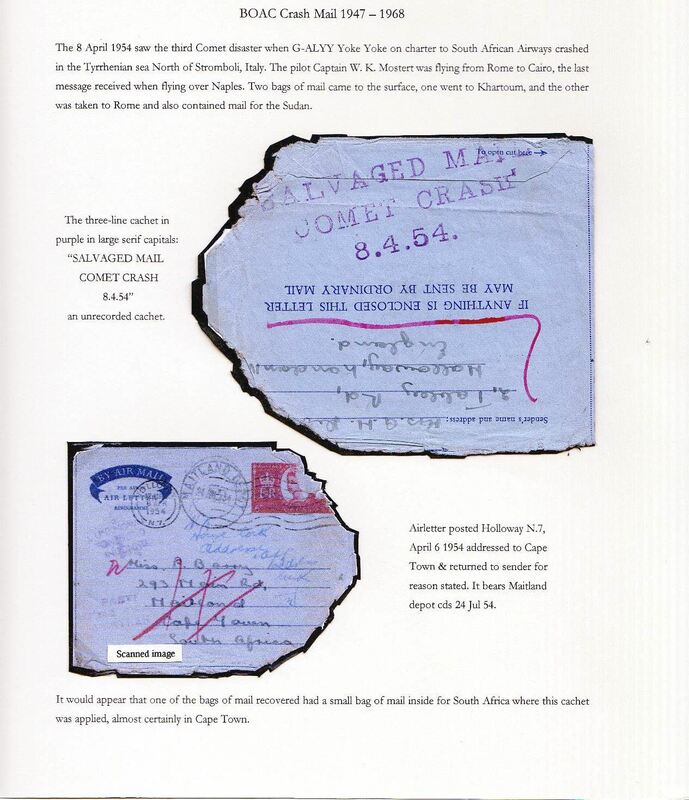 The surviving bag of mail, and some loose, was taken to Rio to be dried out, loose stamps re-affixed, and sorted by destination where a black two line "Damaged By (Sea)/Water" type e cachet was applied to the front on mail for Great Britain. The stamps have been washed off this particular cover. Scarce. 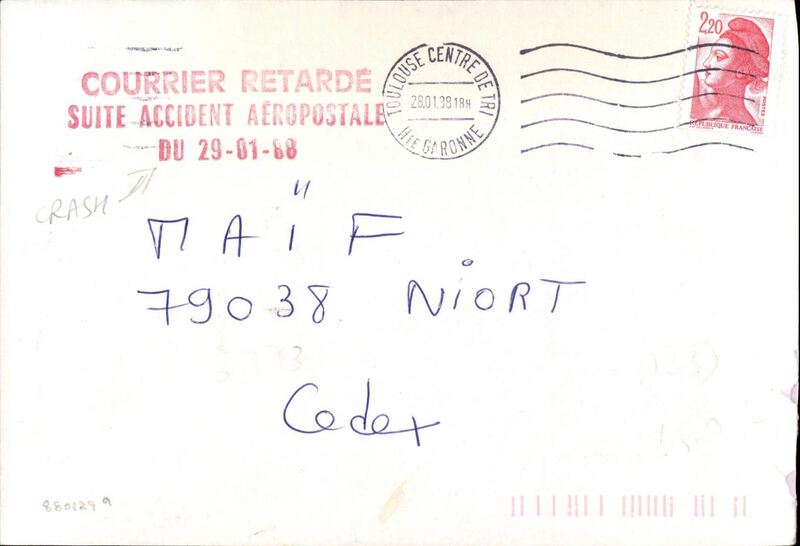 Air Orient Dewoitine 332 "Emeraude" crash at Gwailor en route from Saigon to France, registered (label) blue/grey imprint etiquette airmail cover franked 36c air + 15c ordinary, black framed "Courrier Rapide/'Emeraude'/Saigon-Paris" cachet, ms 'Via Saigon-Marseille". Ni 340106. Faint ironed vertical crease. Flying boat "City of Khartoum" accident at Alexandria, en route from England to Australia, bs Perth 18 Jan 1936, plain envelope with stamps washed off. The mail was recovered by divers, one week later, from the harbour at Alexandria and then sorted by postal workers whilst still sodden. Most of the stamps were washed off. 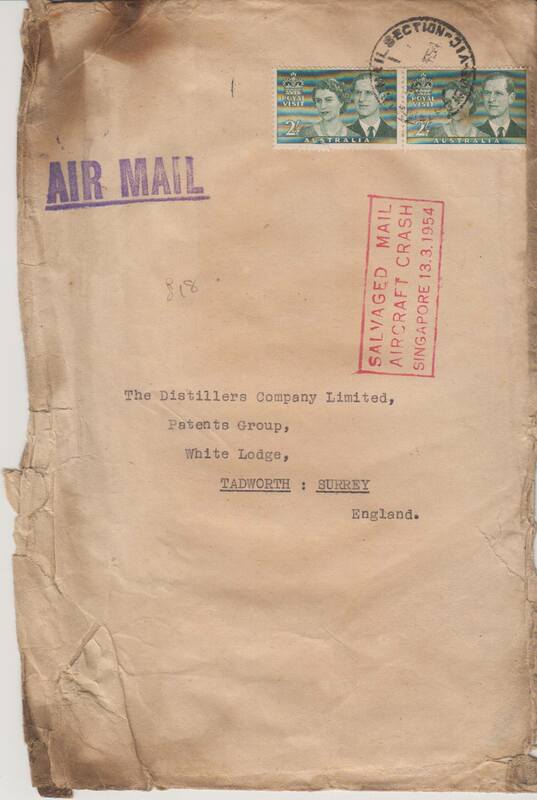 Accompanied by a stencilled letter from the Commonwealth of Australia, Superintendent of Mails "The enclosed air mail letter sustained damage through immersion in the sea when ..........". Nierinck 351231m. 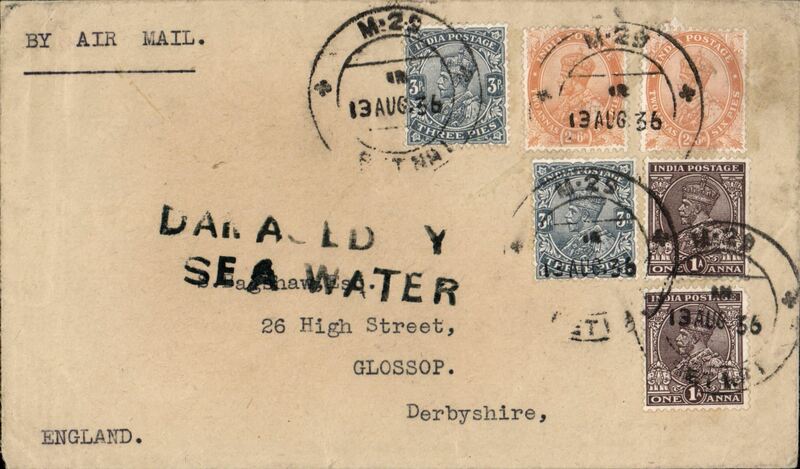 Scipio crash at Mirabella Bay, plain cover, en route from India to London, franked 13 annas, canc uncommon Indian Travelling Post Office standard double ring TPO mark 'M (Madras) 25 SET No.1/ 13 AUG 36', violet type g "Damaged by Sea /Water" cachet. One of the few recovered items with stamps intact. Carried on flight IW469 which left Brisbane on Aug 8th, Ni 360822gg. Nice item. 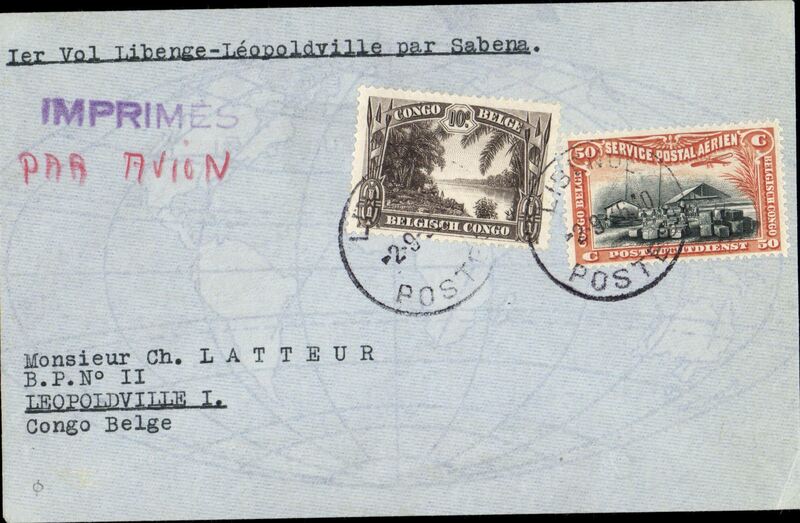 Crash of Sabena F/F Libenge to Leopoldville, bs 6/9, plain cover franked 60c, canc Libenge cds, typed "Ier Vol Libenge-Leopoldville par Sabena". After leaving Libenge it encontered a tornado and was forced down at Bangui and, after leaving Bangui, it was forced down again near Lakr Tumba and the plane was destroyed. Francis Field authentication hs verso, and manuscript confirmation in Field's hand that only 10 covers were carried on this flight. A copy of Nierink's description accompanies this item, ref Nierink 360904. 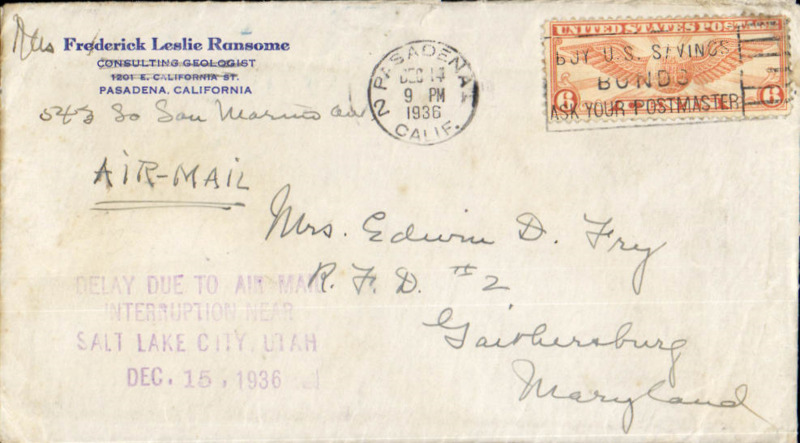 Western Air Express crash at Alpine, Utah on LA to Salt Lake City route, airmail cover franked 6c, canc Pasadena Dec 14 cds, four line cachet "Delay Due To Air Mail/Interruption Near/Salt Lake City, Utah/Dec 15, 1936"
Imperial Airways "Courtier" Short S23 flying boat, 1 Oct 1937 crash in Phleron Bay, Greece, 3 1/2 annas Registered Postal Stationary envelope with scarce green/black "V.P./Park Town" registration label, sent from Madras to The General Medical Council, London, violet framed "Damaged By Sea Water" cachet on front, Ni and Sanford 371001d. Bears a Park Town/29 Aug ?? cds. Also various ms "FI 27136/Reissued" and "Acknowledgement Due/Air Mail". 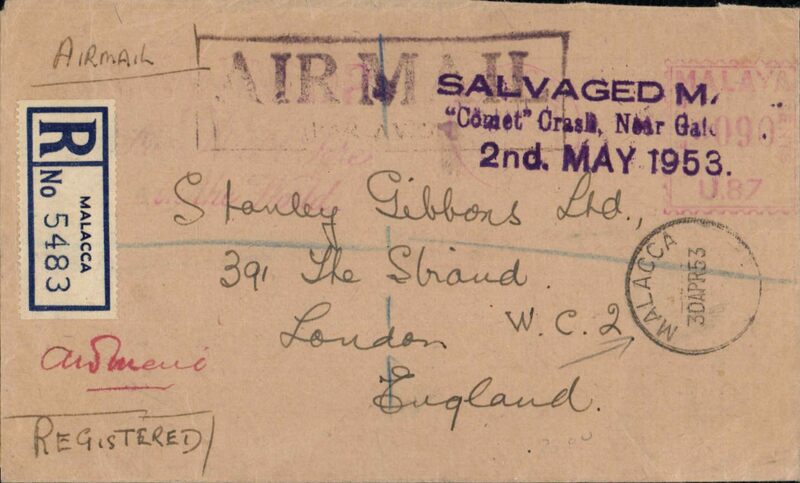 However residues of violet ink below the cachet suggest it might be NI and Sanford 371205L from the 5 Dec 1937 Cygnus crash and the ms "FI 27136/Re-issued" might be the reason for the date of the postmark and the actual date of dispatch. Both crashes were on the Asia-Great Britain route. Interesting. 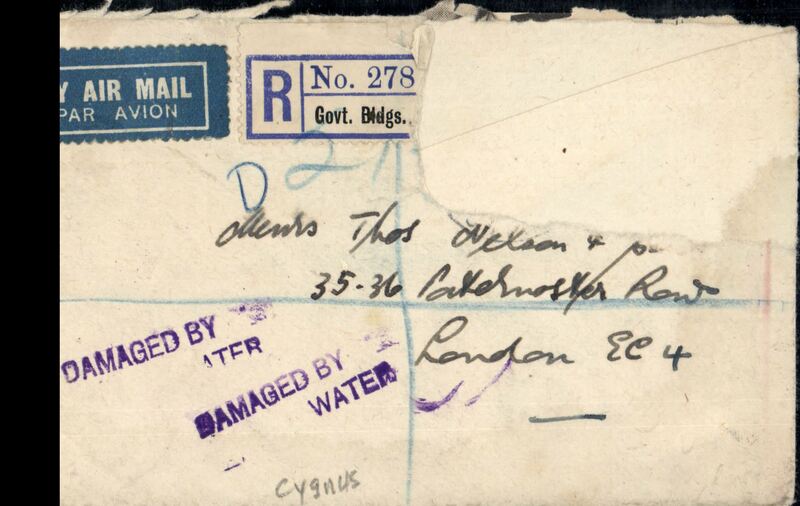 Imperial Airways "Courtier" Short S23 flying boat, crashed Phleron Bay, Greece, plain cover addressed to England franked 13m Palestine stamps, canc Jerusalem 23 Sep 37 cds, violet boxed "Damaged By/Sea Water/in Airplane/Accident" cachet on front, type f applied to mail to GB, Ni and Sanford 371001f. Imperial Airways "Courtier" Short S23 flying boat, crashed Phleron Bay, Greece, plain cover from Rangoon, addressed to Anne Arbor, USA, typed 'Imperial Airways/Rangoon-London/London-New York/New York-Anne Arbor', violet boxed "Damaged By/Sea Water" cachet on front, Type 'd' applied to mail to England, also scarce purple type 'm' cachet "Timbre poste perdue/en transit/Postage stamps lost/in transit, and verso flap sealed with black/brown EIIR "Found open or damaged" tape. Super item. Flying boat "Cygnus" accident at Brindisi, left Karachi en route India to England, violet two line cachet 'Damaged By/Water" used on mail for Great Britain, Ni 371205d. Registered cover, part of the ? Indian reg label "R/No 278..../Govt Buildings" remains. The rest of the label and stamps have been removed neatly. An accompanying newspaper cutting dated Dec 14, 1937, and with the heading 'A Collector's Paradise' explains this. It shows a picture of a room at the GPO London where "experts are drying out the mail and sorting the stamps to see if they have been franked". Interesting and uncommon. Flying boat "Cygnus" accident at Brindisi, left Melbourne en route to England via India, violet framed "Damaged By/Sea Water/In Airplane/Accident" cachet ' used on mail for Great Britain, Ni 371205g. Airmail etiquette cover, canc 24 Nov, 1937 cds, stamps have been washed off. 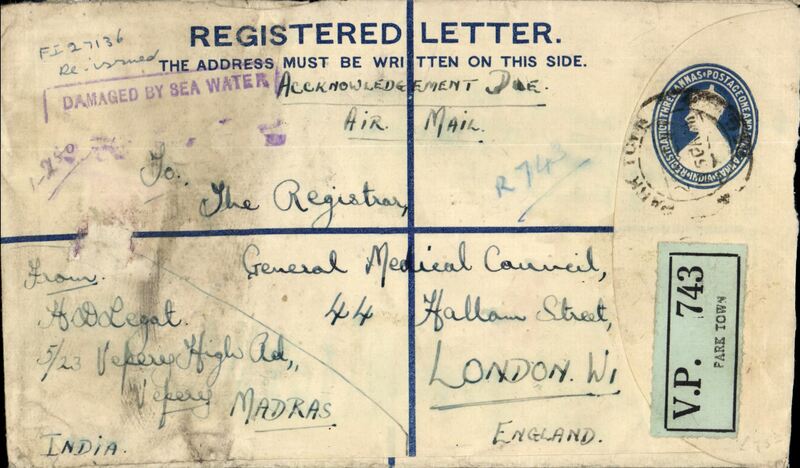 Also the buff PO OHMS ambulance cover 'Fwd Postal Packet/Returned Letter Section/Mount Pleasant/London EC1' which contained the damaged envelope and sent to the destination address of the original cover.Interesting and uncommon. Panagra Douglas DC2 'Santa Lucia' en route Santiago-Antofagasta, crash discovered two years later at Los Eziros in the Andes, fine strike black four line type 'b' accident cachet applied to mail for New York, grey airmail printed company envelope addressed to Bogota, posted Buenos Aires 18/6, stamps washed off, Ni 380619b. Scarce. Crash of Imperial Airways flying boat "Calpurnia" on Lake Ramadi. 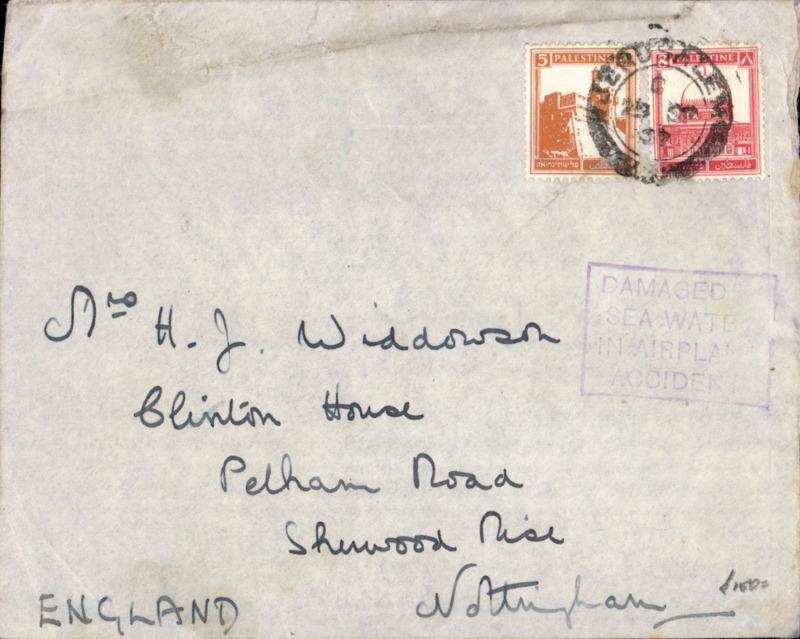 This particular cover is postmarked Birmingham ..........., and is addressed to Messrs. RV Bristol, Wellington, New Zealand, the stamps have been washed off. 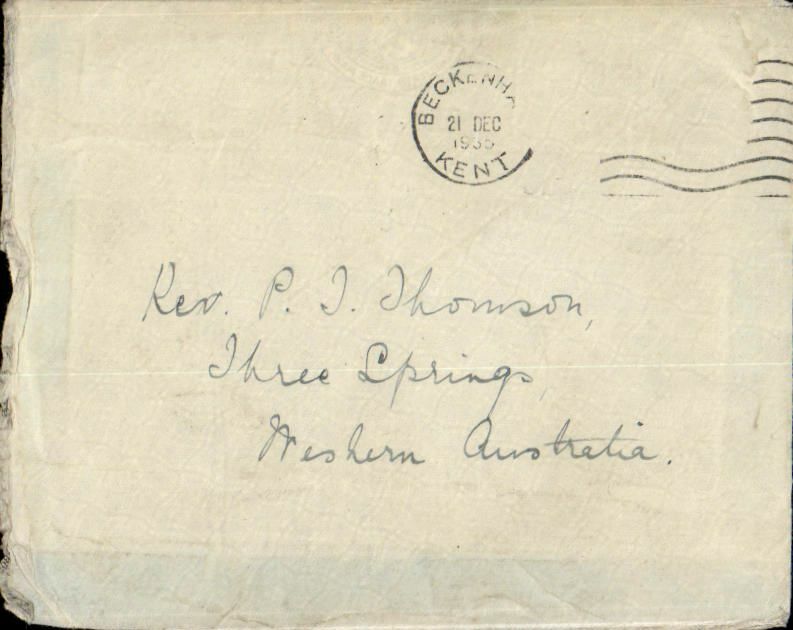 Plain envelope, 26x20cm, with fine strike of violet two line cachet for mail addressed to New Zealand "Received in Damaged Condition/Ex Flying Boat Calpurnia", Ni 381127A. Also typed sheet "......................This envelope was returned to us by our agents - Messrs. RV Bristol & Co Pty Ltd of Wellington, New Zealand". Nice item. 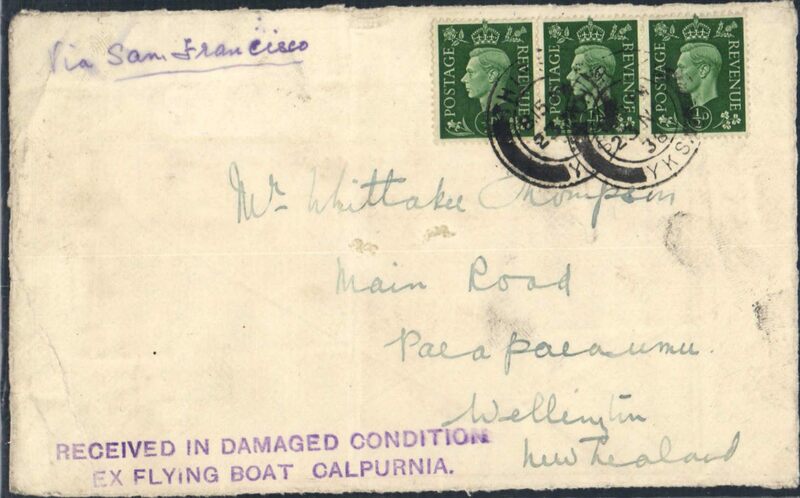 Crash of Imperial Airways flying boat "Calpurnia" on Lake Ramadi, en route from Great Britain to Australia, plain cover (FRONT ONLY) addressed to New Zealand, franked 1 1/2d 'All Up Empire Rate' canc Thirsk/Yorks 23 NO 38, violet two line Type a "Received In Damaged Condition/Ex Flying Boat Calpurnia" cachet. Carried on Imperial Airways flight CE80 which left Southampton on 25th November, Ni 381127a. Crash of Imperial Airways flying boat "Calpurnia" on Lake Ramadi. This particular cover is postmarked Guernsey, 22 Nov, 1938, and is addressed to North Island, New Zealand, the stamps have been washed off. 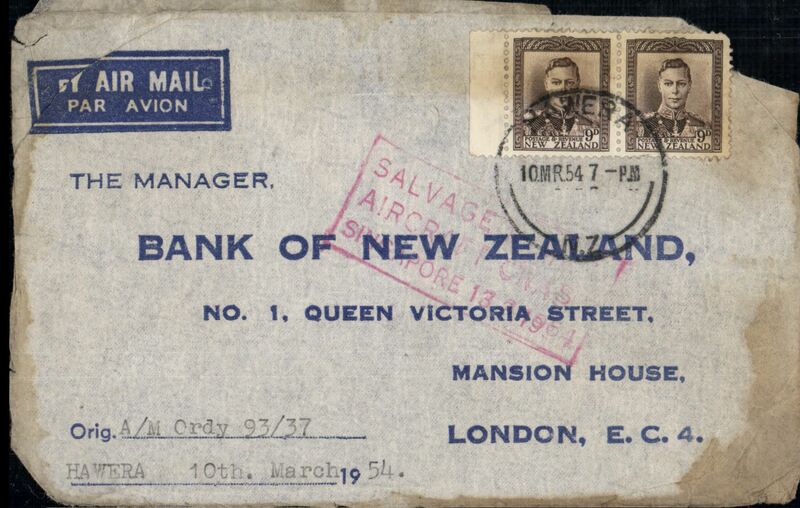 Plain envelope with good strike of violet two line cachet for mail addressed to New Zealand "Received in Damaged Condition/Ex Flying Boat Calpurna", Ni 381127A. Crash of Imperial Airways flying boat "Centurion" on Hoogly River, Calcutta, en route from Malaya to London, plain cover, stamps washed off, partial Malaya (no date remains) postmark, fine strike type 'bb' red two line cachet "Salvaged Mail/Ex . Centurion", 'EX' under 'AL', Ni 390612bb. Some even leaching of dye verso when cachet was applied to damp cover. A 1000 word article about this crash accompanies this lot. Image. Crash of Imperial Airways flying boat "Centurion" on Hoogly River, Calcutta, en route from Waroonda, Australia to England, plain cover, franked 5d, postmarked Waroonda/S Australia/ 7 JE 1939, type 'c' red two line 'CENTURIA' cachet, Ni 390612c. A 1000 word article about this crash accompanies this lot. Image. Crash of FAM 10 Pan Am 'Baby Clipper' S43, southbound service Miami-Buenos Aires, sank in Guanbara Bay on the internal leg Fortaleza-Rio, black one line "Accidente De Avio" cachet, printed 'Department of State USA/Official Business' corner cover addressed to The American Vice Consul, Santos, 15% of cover has been damaged by fire, Ni #390813b. Unusual and scarce. 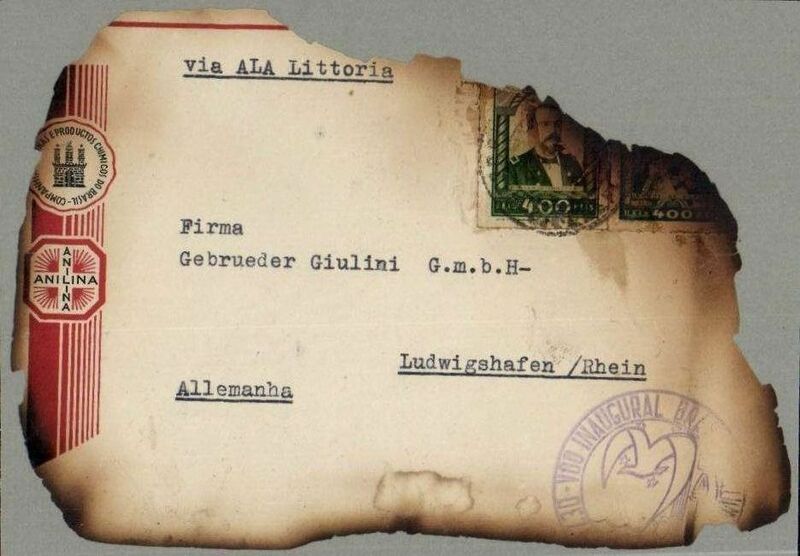 First Regular LATI northbound flight from Rio de Janeiro, crashed in the Atlas mountains near Mogador, charred 85% front showing residue of Brazil 400R x2 stamps, date of postmark unclear, fine 70% residue of first flight cachet, typed "Via Ala Littoria". 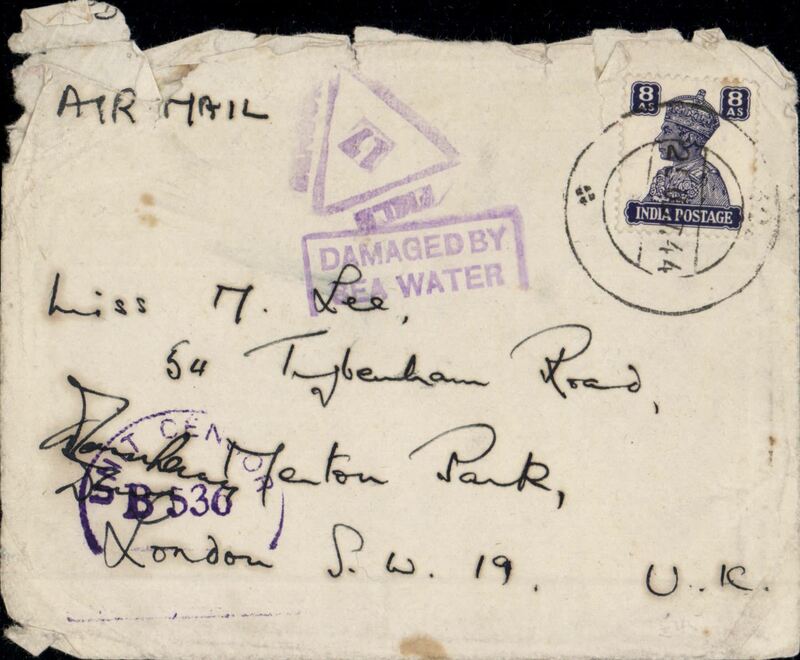 BOAC flying boat 'Portland' crash at Bahrain flying the 'Dragon' route from Hong Kong to London, airmail letter franked 34fls Iraq tamps canc Baghdad 20 Aug 47 cds, purple boxed "Damaged By/Sea Water" cachet, Ni 470823a. BOAC COMET Jet Liner DH 106 crash near Jalalogori on the Delhi to Calcutta section of the ingaore to London route plain cover, franked 70c Malaya (Johore, Perlis) stamps, canc Singapore 1 May 1953, violet Type b cachet "SALVAGED MAIL/Comet Crash, Near Calcutta/2nd. MAY 1953". Exhibit item. 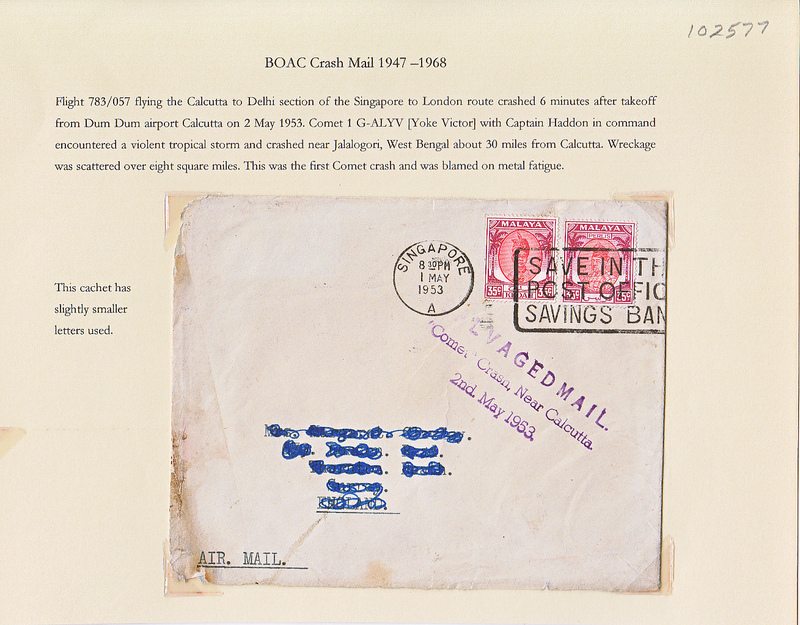 BOAC COMET Jet Liner DH 106 crash on take off from Dum Dum airfield, Calcutta, on a flight from Singapore to London,, imprint etiquette airmail cover from Perak, franked Malaya stamps 2x 35x, canc Telukanson/ 1 MAY 53 cds, two strikes Type a violet "SALVAGED MAIL/'Comet' Crash Near Calcutta/"2nd May 1953", Ni 530502a. 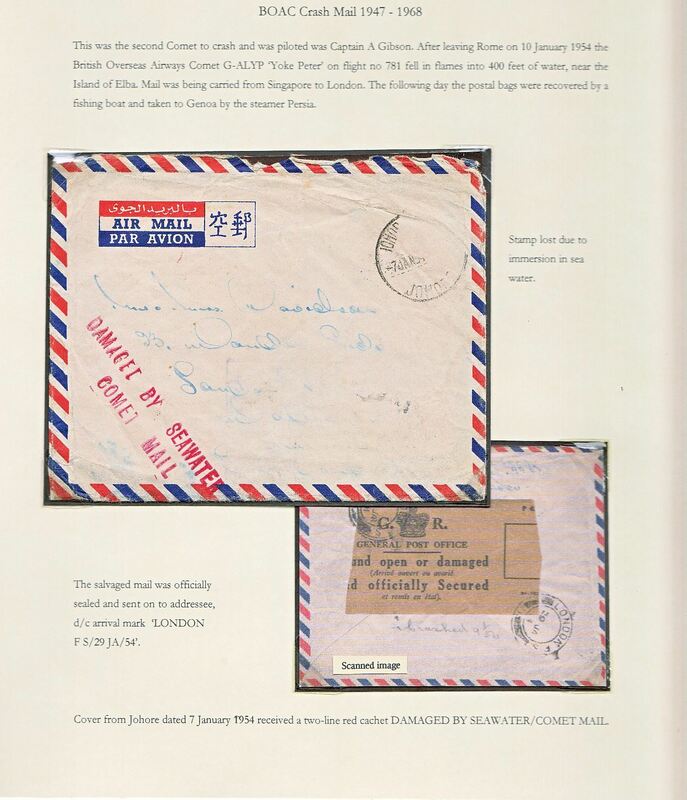 In one strike there is smudging of 'Calcutta' and '1953', and in the other the imprint of 'MAIL' and Calcutta' is missing. Written up on album leaf with an unused B&W ppc, dated March 1951, of a BOAC DH 106 Comet 1 in flight. BOAC COMET Jet Liner DH 106 crash on take off from Dum Dum airfield, Calcutta, on a flight from Singapore to London, registered (label) cover, franked red Malaya meter mark, also 'Malacca/30 Apr 53' cds front and verso and 'Singapore/30 Apr 53' verso, large violet framed 'Air Mailo/par Avion' hs, violet Type b cachet "SALVAGED M***/Comet Crash, Near Gal*****/2nd. MAY 1953" ('G' instead of 'C' in Calcutta)" Ni 530502b. 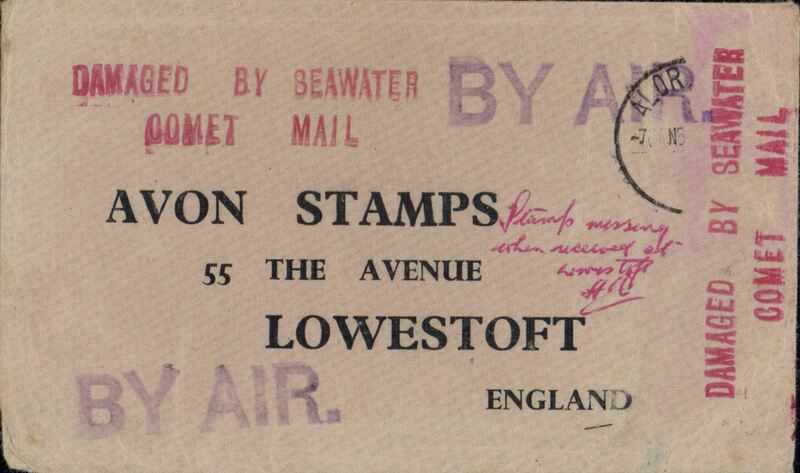 BOAC COMET 1 G-ALYP crash near Elba, on a flight from Singapore to London, via Rome, buff printed commercial cover addressed to Avon Stamps, Lowestoft, England, stamp has been washed off but the residual postmark reads 'Alor' (Star)/'7 Jan' (1954), neat signed ms 'Stamps missing/when received at Lowestoft', verso a 'Found Open on Arrival' seal cancelled by two 'London F.S./27 JA 54' dr cds's, large violet 'BY AIR' x2 on front, and four very fine strikes (two front and two verso) of theType a red "DAMAGED BY SEAWATER/COMET MAIL" cachet, Ni 54010. A handsome example of a scarce item in exhibition condition. BOAC COMET 1 G-ALYP "Yoke Peter", second Comet crash near Elba, on a flight from Johore to London, via Rome, airmail cover, stamp has been washed off but the residual postmark reads 'Johore ****/'7 Jan' (1954), verso a 'Found Open on Arrival' seal cancelled by London F.S./29 JA 54' dr cds, fine strike of theType a red "DAMAGED BY SEAWATER/COMET MAIL" cachet, Ni 54010a. Exhibit item. 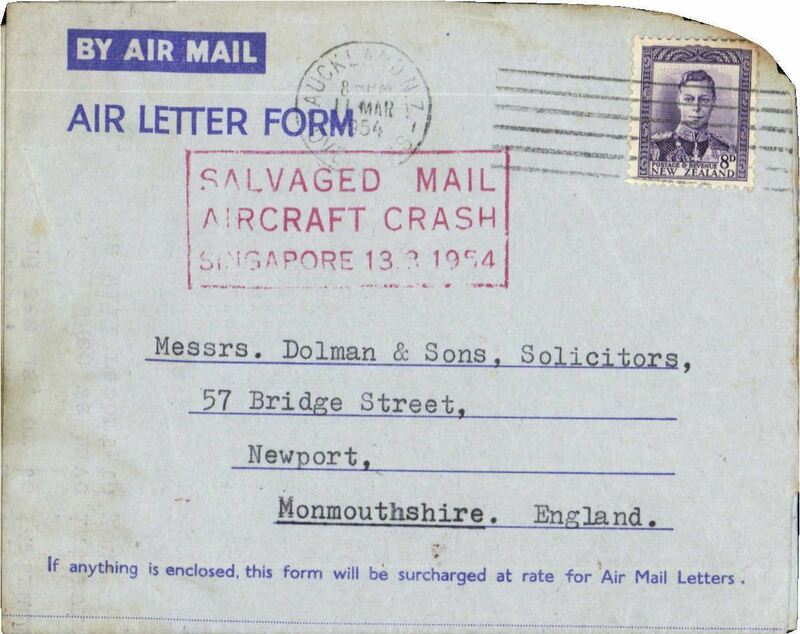 BOAC Lockheed Constellation crash at Singapore, en route from New Zealand to England, imprint etiquette airmail cover, franked 1/6d, canc Hawera 10 Mr 54 cds, fine red boxed "Salvaged Mail/Aircraft Crash/Singapore 13.3.1954" cachet, Ni 540313aa. Significant charring verso. 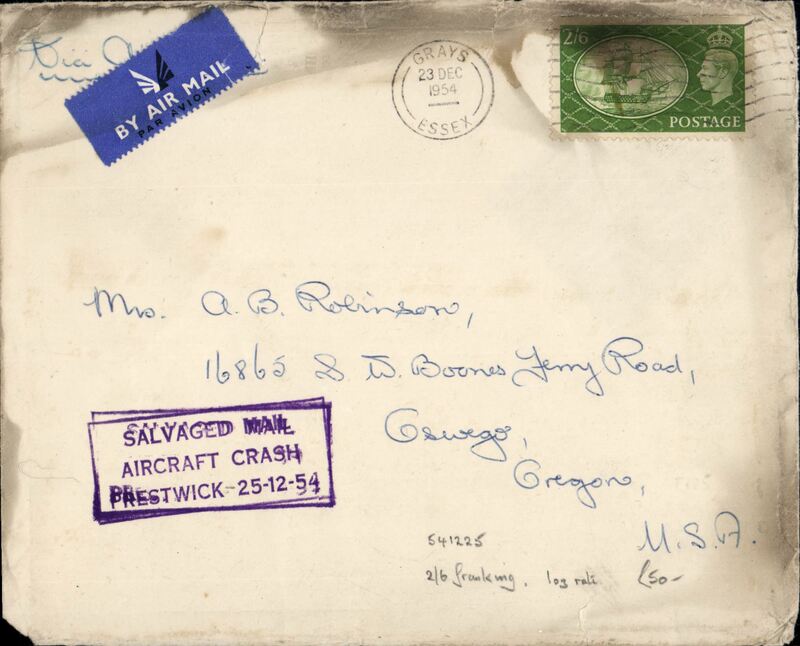 BOAC, Lockheed Constellation crash at Singapore, en route from Australia to England, buff commercial cover, 23x15cm, franked 2/- x2d, canc Airmail Victoria Mar 34, large violet 'Air Mail' hs, fine strike red framed "Salvaged Mail/Aircraft Crash/Singapore 13.3.1954" cachet, Ni 540313a. BOAC Lockheed Constellation crash at Singapore, en route from Christchurch, New Zealand to London, imprint etiquette Bank of New South Wales corner cover, franked 1/6d, canc 11 Mr 54 cds, fine red boxed "Salvaged Mail/Aircraft Crash/Singapore 13.3.1954" cachet, Ni 540313aa. 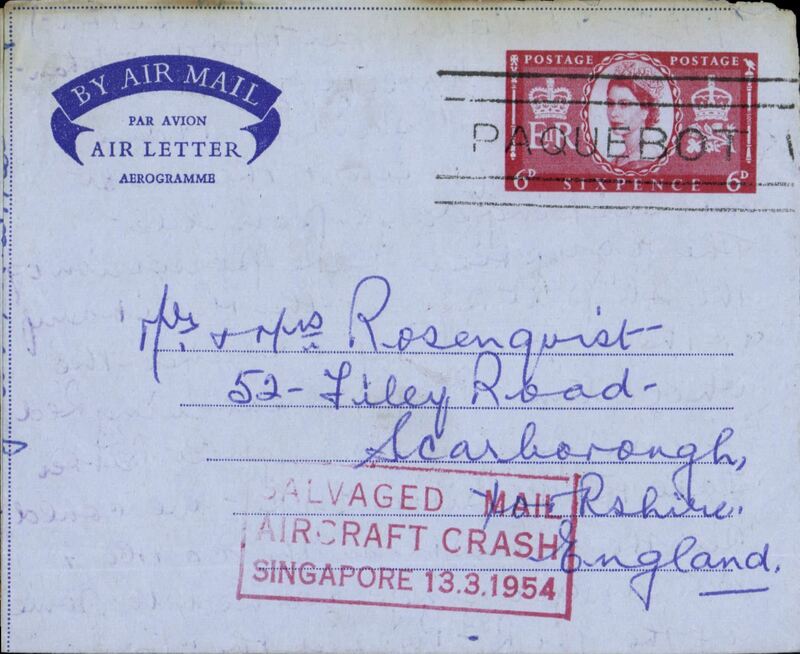 BOAC, Lockheed Constellation crash at Singapore, en route from New Zealand to England, imprint etiquette airmail cover, franked 1/6d, canc Dunedin cds, nice strike red framed "Salvaged Mail/Aircraft Crash/Singapore 13.3.1954" cachet, Ni 540313a. 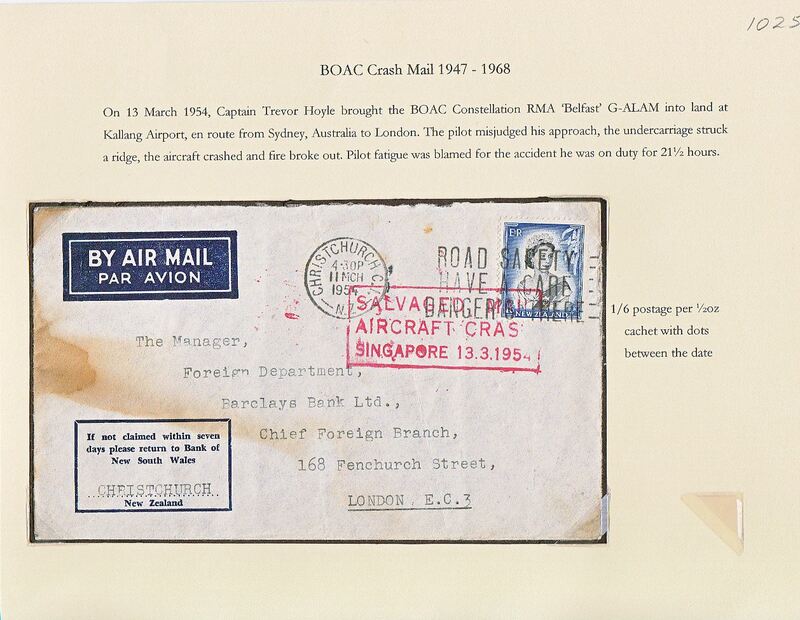 BOAC, Lockheed Constellation crash at Singapore, en route from Australia to Dunkirk, France, plain cover, franked 2/- canc Sydney 10 Mch 1954, fine strike red framed "Salvaged Mail/Aircraft Crash/Singapore 13.3.1954" cachet, Ni 540313a. 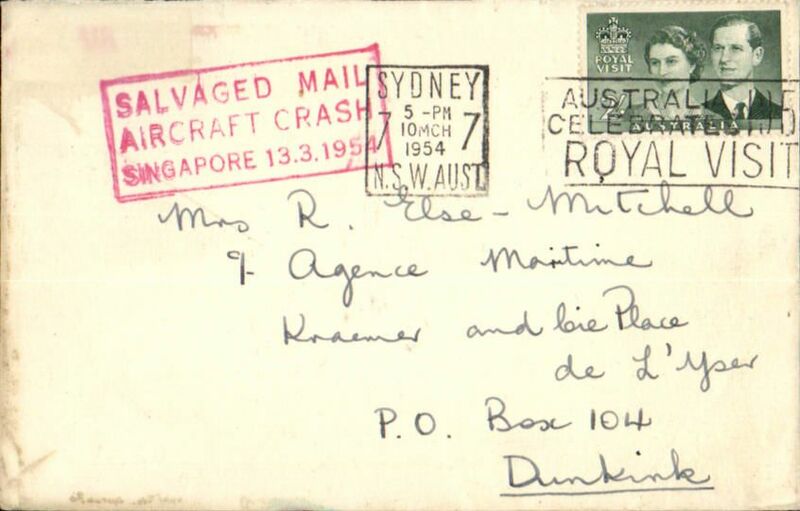 BOAC, Lockheed Constellation crash at Singapore, en route from SS 'Orcades', 'nearing' Freemantle, Australia to England, imprint etiquette airmail cover, franked 6d, 'Paquebot' cancel, nice strike red framed "Salvaged Mail/Aircraft Crash/Singapore 13.3.1954" cachet, Ni 540313a. 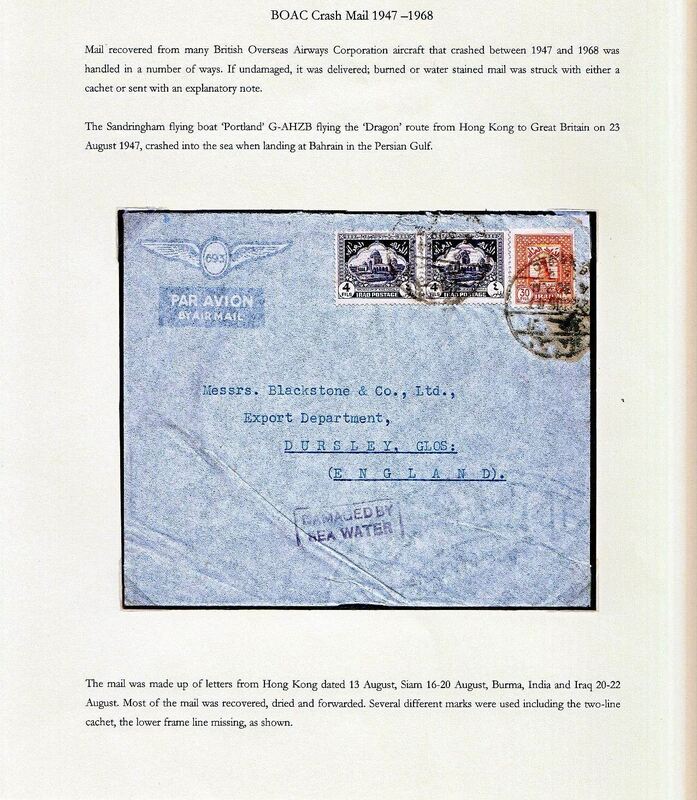 BOAC Lockheed Constellation crash at Singapore, en route from Auckland, New zealand to England, imprint etiquette air letter, franked 8d, canc 11 Mr 54 cds, fine red boxed "Salvaged Mail/Aircraft Crash/Singapore 13.3.1954" cachet, Ni 540313aa. A 200 word accident description accompanies this item. BOAC COMET 1 G-ALYY "Yoke Yoke" on charter to South African Airways, third Comet crash in Tyrrhenian sea, Italy,on a flight from London to Cape Town, airmail cover, 10% loss on edges due to fire damage (see scan), partial stamp loss, but the residual postmark reads 'Holloway/6.Apr/1954, verso an hitherto unrecorded large violet three line "SALVAGED MAIL/COMET CRASH/8.4.54". It would seem that one of the bags of mail recovered had a small bag inside for South Africa where this cachet most likely was applied in Cape Town. Ni540108 unrecorded. Exhibit item. BOAC B377 Stratocruiser "Cathey" crash at Prestwick, UK, en route from London to New York, plain cover (airmail etiquette washed off), franked 3d, some charring along rh edge, slightly doubled violet framed cachet violet "Salvaged Mail/Aircraft Crash/Prestwick 25-12-54" on front, original contents included, arrived at intended destination on 3/3/55 in OHMS service cover with superb strike of the Salvaged Mail/Aircraft Crash/Prestwick 25-12-54" cachet. Ni541225a. Exhibit item. 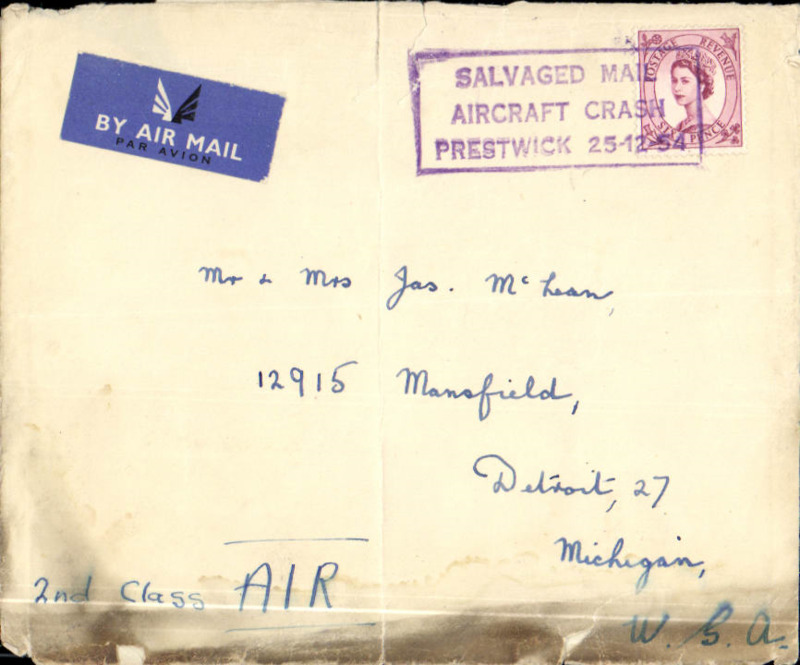 BOAC B377 Stratocruiser "Cathey" crash at Prestwick, UK, en route from Grays, Essex to New York, plain cover, 17x14cm, franked festival 2/6d, slightly doubled violet "Salvaged Mail/Aircraft Crash/Prestwick 25-12-54" boxed cachet on front, some charring along top edge. The white strip along the top edge verso is where the cover was not completely covered by its plastic wallet when scanned. BOAC B377 Stratocruiser "Cathay" crash at Prestwick, UK, en route from England to New York, envelope addressed to New York, franked 1/- x2 and 6d (all top edge damage), canc Manchester/22/12/54, 50% strike purple boxed "Salvaged Mail/Aircraft Crash/Prestwick 25-12-54" cachet, Ni 541225a, uncommon red/white "If you want to get ahead/Get a Hat" label. 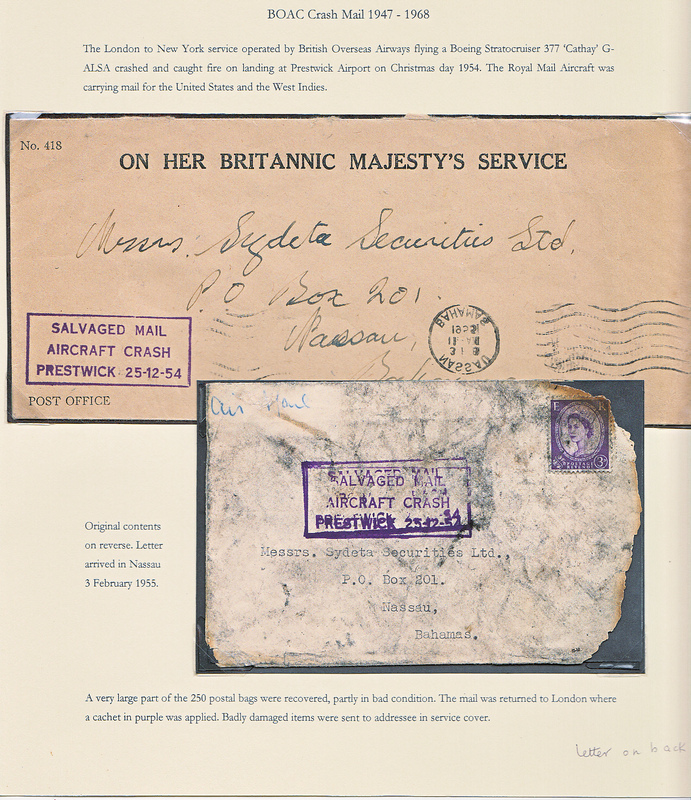 Rare Diplomatic Pouch/OHMS mail rescued from BOAC B377 Stratocruiser "Cathay" crash at Prestwick, UK, en route from England to New York, envelope addressed to New York, unfranked buff "On Her Britannic Majesty's Service" cover, 25x12cm, fine strike purple boxed "Salvaged Mail/Aircraft Crash/Prestwick 25-12-54" cachet, Ni 541225a. 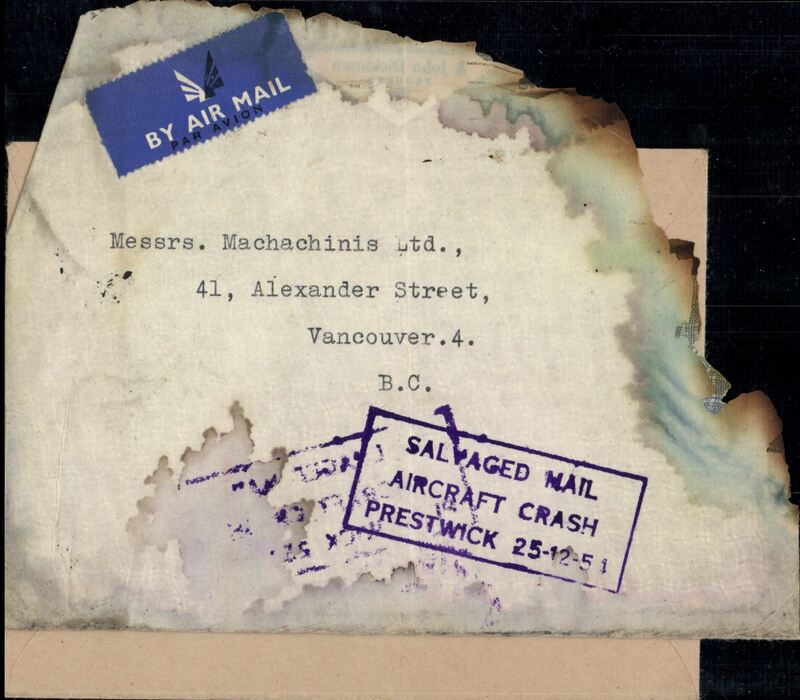 BOAC B377 Stratocruiser "Cathey" crash at Prestwick, UK, en route from England to Toronto New York, plain cover, stamps washed off, particularly fine purple boxed "Salvaged Mail/Aircraft Crash/Prestwick 25-12-54" cachet, Ni 541225a. 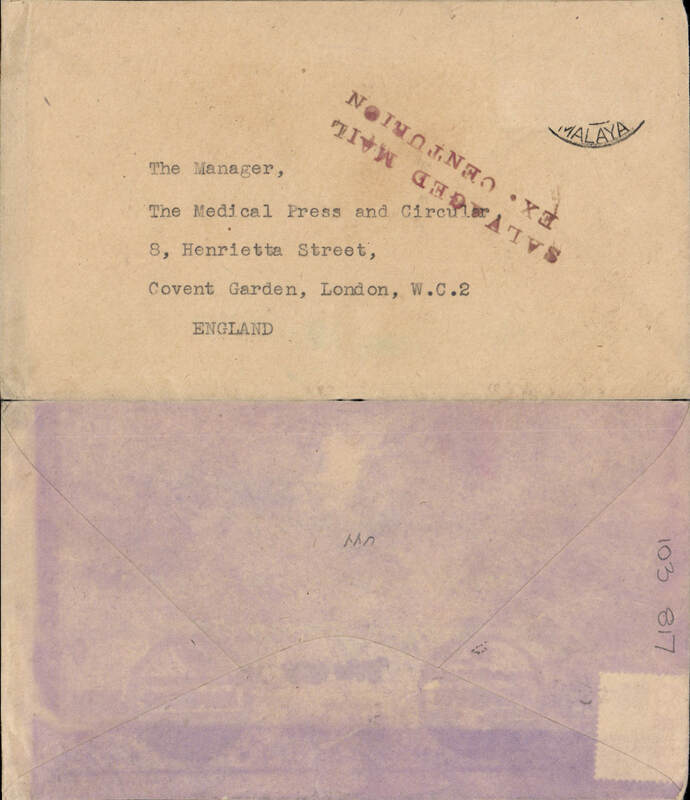 Also the buff PO OHMS ambulance cover which contained the damaged envelope, also with a fine strike of the accident cachet, and sent to the destination address of the original cover. Uncommon. BOAC B377 Stratocruiser "Cathey" crash at Prestwick, UK, en route from England to TorontoNew York, plain cover, stamps washed off, canc good strike London SW1 23 Dec 1954 machine cancel, fine purple boxed "Salvaged Mail/Aircraft Crash/Prestwick 25-12-54" cachet, Ni 541225a. 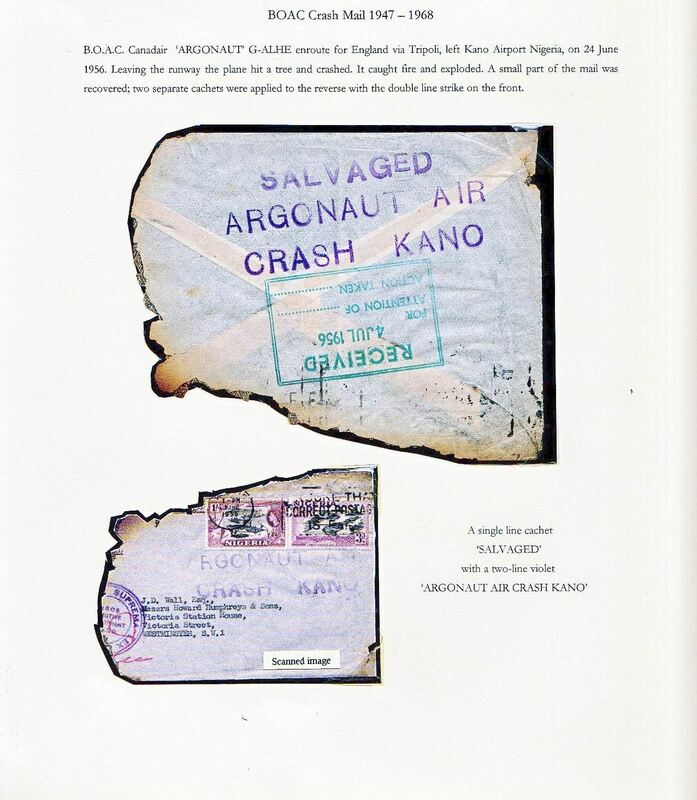 BOAC 'Argonaut' crash at Kano Airport en route for England, airmail letter franked 1/3d Nigeria stamps canc June 1956 cds, 10% loss on edges due to fire damage (see scan), large purple two line "Argonaut Air/Crash Kano" front and verso, also purple single line "Salvaged" cachet verso. Only a small amount of the mail was recovered, Ni 560624. Exibit item. 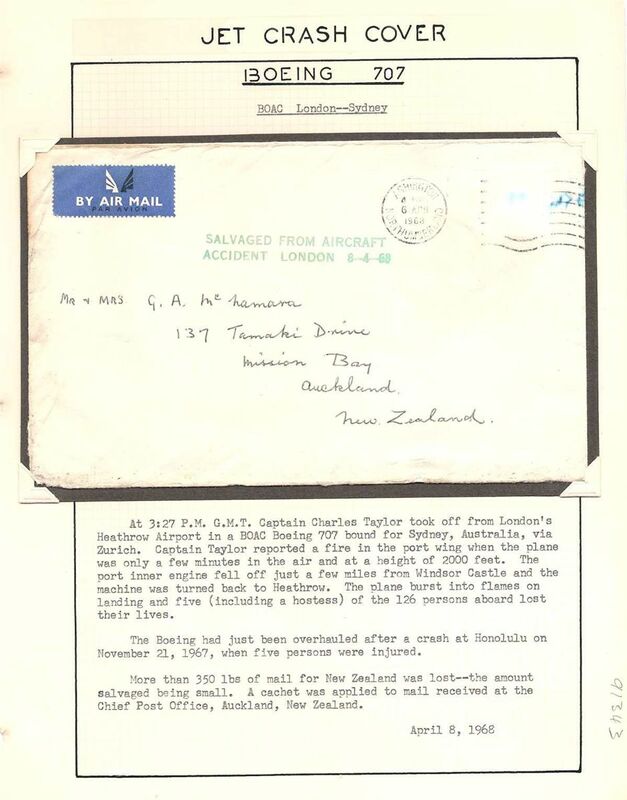 Crash of BOAC Boeing 707 at Heathrow, en route from London to New Zealand, airmail etiquette cover addressed to Canada, stamp washed off, postmarked Guernsey 6 APR 1968, good strike green two line "Salvaged From Aircraft/Accident London 8-4-68". 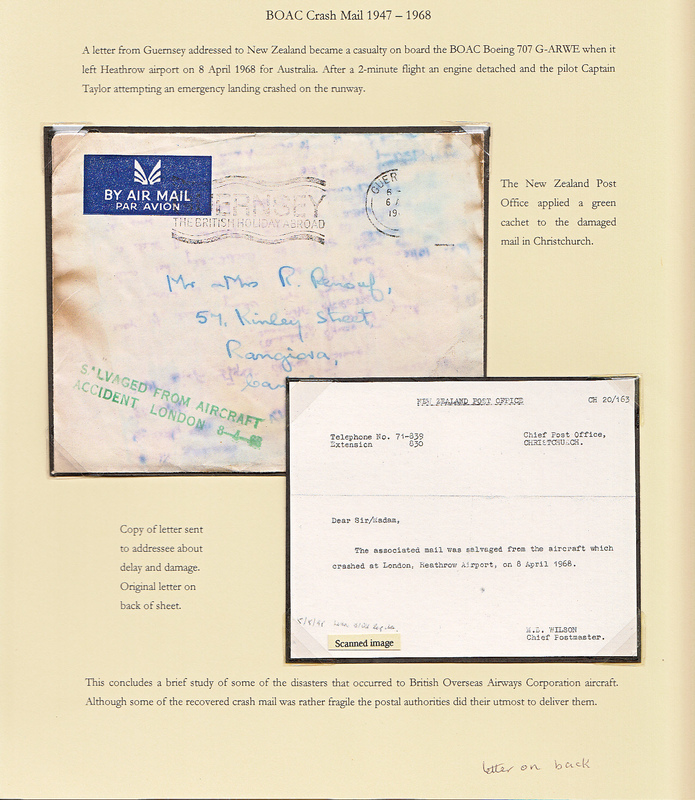 Also included is the original note sent from the Chief Postmaster at Christchurch together with the recovered letter to the addressee which says "The associated mail was salvaged from the aircraft which crashed at London Heathrow airport on 8 April 1968".. Ni680408 b and k. Exhibit item. BOAC Boeing 707 crash at London Heathrow airport, en route from London to Australia, via Zurich, plain cover addressed to Auckland, New Zealand, stamp/s washed off, postmarked Ashington/Northumberland/ 6 APR 1968, very fine strike green cachet applied to mail to New Zealand "Salvaged from Aircraft/Accident London 8-4-68", Ni680408b. A 125 word type written text giving details of this crash accompanies this item. Vickers Vanguard flight which crashed on take off at Toulouse airport en route to Paris, commercial cover franked 2.20f , fine red three-line cachet at upper left "Courrier Retarde/Suite Accident Aeropostale/du 29-01-88". Only about a third of the mail was recovered from this flight. Excellent clean condition for a crash item.